What is it with artists and toilets? 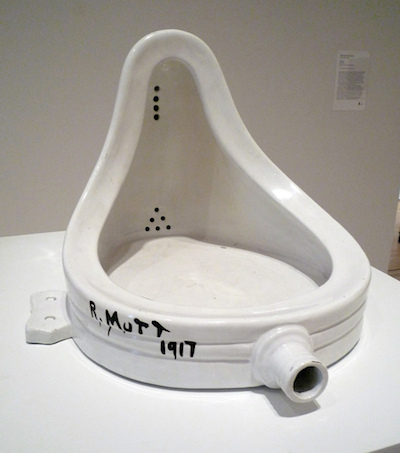 From the days of Marcel Duchamp and his infamous urinal installation, many conceptual artists seem to feel like a toilet is an original means of expression. While a toilet is arguably a means of expression, it's rarely one that most people would associate with artistic expression. Of course, we've covered a number of toilet installations in the past partly due to their hilarity factor, but this latest one sort of verges on the surreal. Just days before the upcoming US presidential election between Donald Trump and Hillary Clinton, a toilet covered in a wide range of anti-Trump rhetoric with the words 'Dump on Trump' was left outside the back door of the American Visionary Art Museum. The Museum is currently treating it as an artistic donation, and has yet to dispose of the "piece" in the hopes that the artist will come forwards. Rebecca Hoffberger, the executive director and founder of the AVAM says that this is far from the first piece of donated art they have received, and hilariously enough, it's not even the first - or even the second - toilet that they have received. The first two were sent in by another artist, Duane Gerald "Shorty" Davis Sr., but neither contained anything close to the kind of rhetoric on the 'Dump Trump' sculpture - or perhaps installation piece? Conceptual specimen? Terminology fails to cover such eventualities. The AVAM has no plans to destroy the piece, but it may not be put on display without a claim of ownership by the artist, and Davis has disavowed this current piece. "We totally believe in individual freedom of expression, but we’re also very concerned about anything that could be directed ... on just anger and hate. Because in the long run, I don’t think that solves anything," continues Hoffberger. Here's hoping that the AVAM keeps the piece and that the artist comes forwards to claim the piece in the horrific event of a Trump victory - or even in the case of a Clinton victory, as a memory of just how close the country came to jumping the shark.